Video: TEDxEmory - Josh Levs - Breaking the System to Achieve the Impossible . Video: Josh Levs - "Shine" - HOBY WLC Keynote . Video: Google Glass and kids' safety . Josh Levs is a father of three, a CNN journalist, and author of All In (HarperOne). When Levs was denied fair parental leave by his employer after his child was born, he fought back—and won. In the process, he became a leading advocate for modern families. 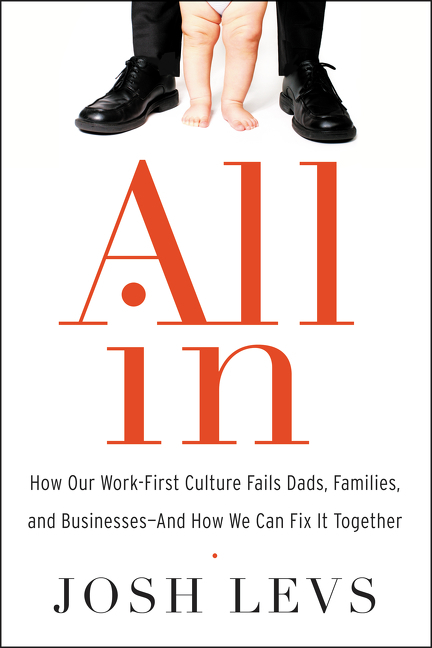 In All In, he shows how fatherhood today is far different from previous generations and what it means for our individual lives, families, workplaces, and society. Nowadays, stay-at-home dads are increasingly common, and growing numbers of men are working part-time or flextime schedules to spend more time with their children. Even the traditional breadwinner-dad is being transformed. Dads today are more emotionally and physically involved on the home front. They are “all in” and—like mothers—they are struggling with work-life balance and doing it all. Journalist and “dad columnist” Levs explains that despite these unprecedented changes, our laws, corporate policies, and gender-based expectations in the workplace remain rigid. They are preventing both women and men from living out the equality we believe in—and hurting businesses in the process. Women have done a great job of speaking out about this, Levs—whose fight for parental leave made front page news across the country—argues. It’s now time for men to join in in a big way. It is this combined knowledge base of personal experience, investigative reporting, and frank conversations with fathers that makes for a captivating speaker – whether it is to global organizations, leadership conferences, universities, or parents groups. His work and the importance of his fight can be relatable to so many audiences and is critical to the future of how we look at equality. An avid keynote and motivational speaker, Levs is able to tailor his message for a variety of crowds. Prior to CNN, Levs was a reporter for NPR. His many prizes include six Peabody awards, two Edward R. Murrow awards, awards from DuPont-Columbia, the national Association of Black Journalists, and a designation as a Journalist of the Year from the Atlanta Press club. One award from a foundation allowed him to choose any college or university to receive a scholarship in his name, and he chose his alma mater, Yale University. He now lives in Atlanta, Georgia. “Josh Levs blew us all away, and I have never seen anyone do a better job! EVER!!!!!" -One of many responses on YouTube to Josh Levs’ TEDx Talk, "Breaking the System to Achieve the Impossible." "His message about the role of media in a complex, evolving world was timely, well informed, and profoundly human. Our students experienced the insights and passion of someone with a genuine reverence for the truth and for the potential of each member of his audience to change the world. I would like to have been able to share my very positive reaction with him in person after his presentation, but he was surrounded by students wanting to learn more." "He was fabulous! A riveting storyteller with a powerful message that will empower men and women...The event was packed (standing room only) and it opened up great conversations that continued long after the event was over." "What a joy it was to have Josh Levs as the keynote speaker! Josh's speech was engaging and informative, serving to not only inspire our audience...but also opening their eyes to an important issue in today's workplace culture. His style is relaxed but energized--your audience will be leaning forward in their seats as he speaks!"